The Islamic State group claimed responsibility Wednesday for a pair of stunning attacks on Iran's parliament and the tomb of its revolutionary leader, Ayatollah Ruhollah Khomeini, which killed at least 12 people and wounded more than 40. Reza Seifollahi, an official in the country's Supreme National Security Council, was quoted by the independent Shargh daily as saying that the perpetrators of the attacks were Iranian nationals. He did not elaborate. The statement said Saudi Arabia "constantly supports" terrorists including the Islamic State group, adding that the ISIS claim of responsibility "reveals (Saudi Arabia's) hand in this barbaric action." The ISIS group's Aamaq news agency released a 24-second video purportedly shot inside the complex, showing a bloody, lifeless body on the floor next to a desk. Shops in the area were closed as gunfire rang out and officials urged people to avoid public transportation. Witnesses said the attackers fired from the parliament building's fourth floor at people in the streets. The Interior Ministry said six assailants were killed — four at the parliament and two at the tomb. A senior Interior Ministry official told Iran's state TV the male attackers wore women's attire. Saudi Arabia and Iran regularly accuse each other of supporting extremists in the region. Saudi Arabia has long pointed to the absence of IS attacks in Iran as a sign of Tehran's culpability. For its part, Iran has cited Saudi Arabia's support for jihadists and its backing of hard-line Sunni fighters in Syria. Trump's first overseas visit to Saudi Arabia last month positioned the U.S. firmly on the side of the kingdom and other Arab states in their stance against Iran. His assurances of Washington's support emboldened hawkish royals in Saudi Arabia, which is at war in Yemen against Iranian-allied rebels. Saudi Arabia has been a target of numerous lethal attacks by ISIS affiliates who see the kingdom's Western-allied leadership as heretics. The group has also targeted Shiites in Saudi Arabia and Kuwait. ISIS militants are fighting Iranian-backed forces in Syria and Iraq, and they view Shiites as apostates. Nelly Lahoud, an expert on extremism at the International Institute for Strategic Studies in Bahrain, said ISIS leaders may be looking to rally supporters through the attacks in Iran as they lose ground in Syria and Iraq. "Now that they are unable to maintain the promise of territory, attacking Iran is to their advantage," she said. "It wouldn't surprise me if this were planned for a long time." On March 27, the ISIS group posted a 37-minute video in Farsi threatening Iran. The Clarion Project said the speakers claimed to represent various Iranian Sunni ethnic groups, such as the Baluchis and Ahvazis, and encouraged Iranian Sunnis to join the group. Wednesday's attacks, during the holy month of Ramadan that is observed by both Sunni and Shiite Muslims, came as the Islamic State is competing with al-Qaida for jihadi recruits. Arab separatists are active in Iran's southern city of Ahvaz, where they killed two policemen three weeks ago. Though most Iranians are Shiite, including separatists in Ahvaz, the eastern Baloch region is majority Sunni, although there are no recent census figures available. There is also a significant Sunni population in southern Hormozgan province. The attacks drew condemnation from Iran's allies — and also from the United States. That was notable because of the deep distrust between Tehran and Washington, which don't have diplomatic relations. Russian President Vladimir Putin sent condolences and confirmed Moscow's willingness to aid its ally. Syria's Foreign Ministry also condemned the attacks, which it said were backed by various governments that it did not specify. The ISIS group often claims attacks around the world, even when links to the group cannot be confirmed. Iranian security officials have not said who might have been behind the attacks, although state media called the assailants "terrorists." 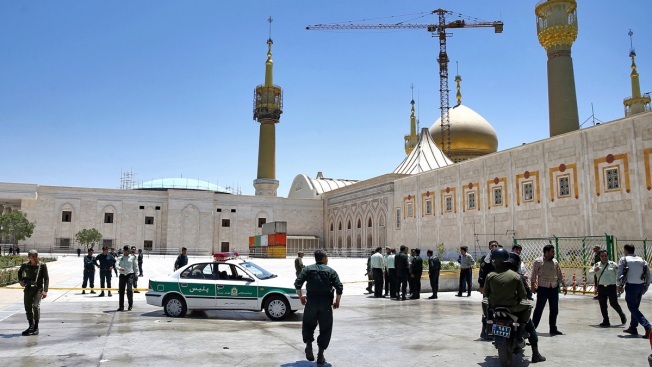 Charlie Winter, a senior research fellow at King's College London, said the attacks could provoke a disproportionate counterterrorism response in Iran. "Iranian officials will be called upon to step up intervention in Iraq (and) Syria big time," he said, adding that Wednesday's attacks will significantly boost ISIS morale amid battlefield defeats.